Pyle's disease, commonly known as metaphyseal dysplasia, is an extremely rare genetic disorder with autosomal recessive mode of transmission. 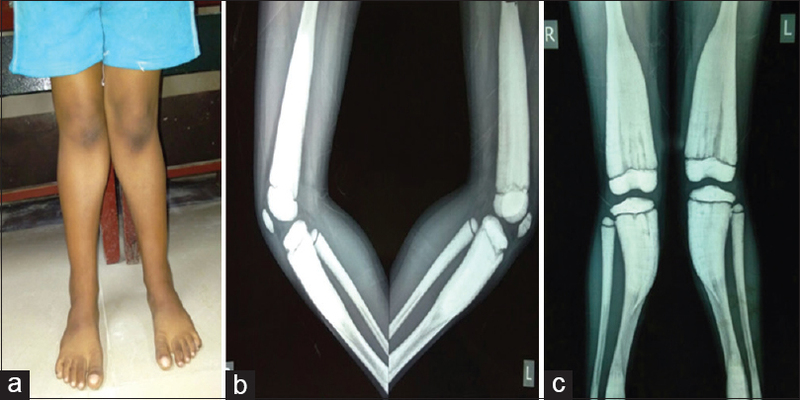 A case of Pyle's metaphyseal dysplasia in a 9 year old boy presented with a complaint of retained milk teeth and discharging pus from oral cavity with genu vulgum clinically and abnormal broad metaphyses of tubular bone radiologically. Cone-beam computerized tomography of maxilla and mandible showed decayed teeth, multiple retained deciduous teeth, and unerupted permanent teeth. We also found bilaterally permanent tooth with dwarf roots and large pulp chamber (taurodontism) as well as discontinuation of labial cortex of mandible. Pyle's disease, commonly known as metaphyseal dysplasia, is considered as a rare skeletal disorder which is benign in course. This genetic disorder inherited in an autosomal recessive pattern, and its causal genetic mutation is still unknown.,,, An American orthopedic surgeon, Edwin Pyle in the year of 1931, first described this disorder in a 5-year-old child.,, Followed by the reports of familial incidence by Bakwin and Krida in 1937 and in 1970, Gorlin first described craniometaphyseal dysplasia as a distinct entity, which is separate from metaphyseal dysplasia. 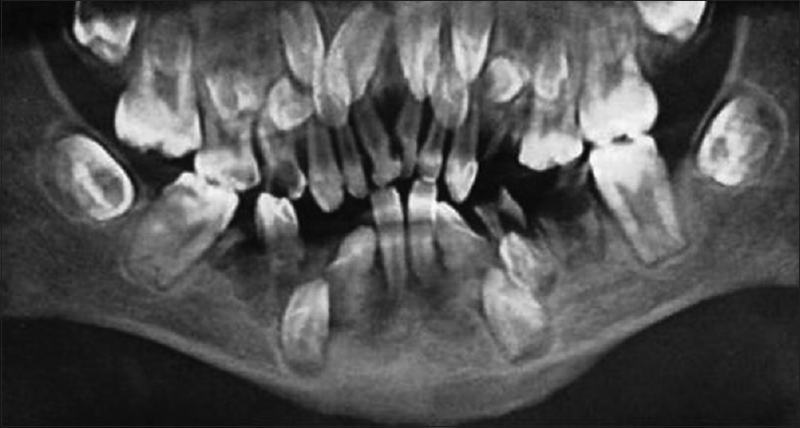 Considering both the rarity of the disease and its typical clinicoradiographic presentation, we report a case with an emphasis on dental and orofacial findings. A 9-year-old boy was referred to the Department of Dentistry with a chief complaint of retained milk teeth and pus discharge from the oral cavity for more than 6 months. The patient had a history of tooth extraction before. He was referred from the Department of Pediatric Medicine for dental evaluation after a radiological finding of Erlenmeyer flask bone deformity with a diagnosis of Pyle's disease. On clinical examination, the patient had prominent genu valgum. Height, weight, and head circumference were average for age. Developmental milestone and intelligence were normal. Radiographs showed widened and thickened metaphyses of long bones as well as ribs with increased generalized bone density [Figure 1] and [Figure 2]. There were no scoliosis, no muscle weakness, no cranial nerve compression, and no history of joint pain. Blood investigation showed normal serum calcium, phosphate, Vitamin D3, magnesium, and thyroid and parathyroid function tests. Routine blood investigation was also within normal limits. The patient presented with mild dysmorphic facial features. He had prominent pinna, mild occipital bossing, depressed central portion of cranial vault, and mandibular prognathism. Intraoral examination revealed the presence of 36, 46, 44 and erupting 31, 32, 41, 42. No other permanent teeth were clinically visible. The remaining teeth were all deciduous. Oral hygiene of the patient was poor, dental caries was present in multiple teeth, and severe malocclusion was seen. Multiple intraoral abscesses with draining sinus were also visible in mandible [Figure 3]. Orthopantomogram of mandible showed completely erupted 31, 41, 36, 46, and 44; developing crown in 37.47 with normal eruption crypt; retained and resorbed roots of 74.75 and 85; as well as missing permanent 35 and 45. Incomplete root formation was seen in 32 and 42 as well as developing crown was seen in unerupted 33 and 43. Dwarfed roots with large pulp chamber were seen in teeth 36 and 46. These features are suggestive of hypertaurodontism [Figure 4]. Cross-section of cone-beam computed tomography (CBCT) mandible (anterior region) showed discontinuation of labial cortex with shadow of thin cortex shell of bone over cortex with radiolucent area in between. Bilateral inferior alveolar canal also showed loss of cortication [Figure 5] and [Figure 6]. 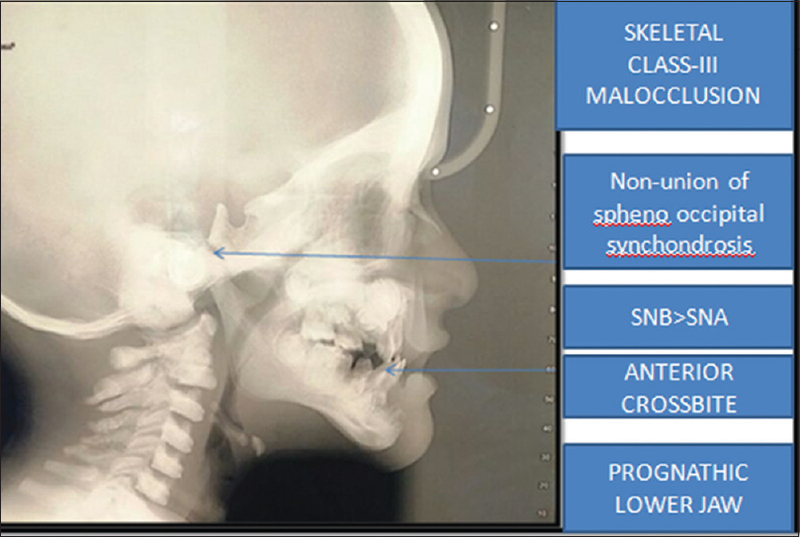 Lateral cephalogram of the patient revealed reverse overjet, skeletal and dental Class-III malocclusion, prognathic mandible, and failure of closure of spheno-occipital synchondrosis [Figure 7]. As intraoral multiple draining sinuses were present for a long time, culture and sensitivity tests were done. Culture showed growth of pseudomonas species which was sensitive for amikacin, imipenem, carbenicillin, tobramycin, aztreonam, ceftazidime plus clavulanic acid, and polymyxin B. Later on, the patient was referred back to pediatric medicine for further management. The Erlenmeyer flask deformity in Pyle's disease has attracted the attention of various researchers; as this feature may be also manifestations of craniometaphyseal dysplasia, craniodiaphyseal dysplasia, osteoporosis, prolonged led poisoning, Gaucher's disease, Niemann–Pick disease, severe thalassemia, Ollier disease, as well as diaphyseal aclasis.,, The absence of typical changes in laboratory tests and characteristic clinical manifestations rules out the possibility of hematological as well as storage disorder in our patient. Craniofacial dysplasia is often confused with Pyle's disease since its description. In 1970, Gorlin et al. described craniofacial dysplasia as a distinct entity from Pyle's metaphyseal dysplasia. Pyle's disease has gross widening of metaphyses with mild cranial sclerosis. In contrast, craniometaphyseal dysplasia has greater cranial sclerosis with mild metaphyseal changes.,,, Oral manifestations of Pyle's disease include decayed teeth, malocclusion, prognathism of mandible, delayed eruption, and retained deciduous teeth. Although carious teeth, malocclusion, and jaw prognathism are common in literature, only Narayanan et al. reported multiple retained deciduous teeth and missing permanent teeth as manifestations of this disorder. In our patient, we also found multiple retained deciduous teeth, delayed eruption as well as absence of permanent tooth bud. These findings correlate with the findings observed by Narayanan et al. Hence, these findings suggested that these findings could be consistent features of this disease rather than coincidental findings, though observations of few more cases of this disease with the same findings are required to prove it. The CBCT of our patient revealed that tooth numbers 36 and 46 had dwarfed roots with large pulp chamber. These features are suggestive of hypertaurodontism. We also observed loss of cortication of inferior alveolar canal bilaterally as well as discontinuation of labial cortex in anterior mandible. A review of literature failed to yield these features in previously reported cases. As bone softness and fragility are well documented in literature as the characteristics of this disease, the concerns about the ability to withstand trauma to jawbones and nature of healing in patient naturally arise. Although the etiopathogenesis of this disease is not clear yet it is considered that there is abnormal subperiosteal remodelling in the metaphyses. The reason behind this is assumed to be chronic hyperemia of the perichondral ring of osteoblast. The hyperemia may be due to congenital hyperplasia of the perichondral ring arteries. As per the literature, Lindberg and Watts performed osteotomy of the left and proximal tibia in a 15-year-old boy who was having Pyle's disease. Based on the result of the procedure, they concluded that the postoperative course was similar to that of patients without the disease., Hence, Narayanan et al. opinionated that extraction and surgeries may have favorable outcome in patients with Pyle's disease. They also advised to use minimum force for tooth extraction, as mineral density may be reduced in these patients. Proper documentation and detailing of a larger number of such cases may be helpful to establish the consistent orofacial features of Pyle's disease in future. We would like to thank Dr. Pallab Kumar, Professor and H. O. D., Department of Dentistry, N. R. S. Medical College and Hospital for his valuable guidance regarding diagnosis and presentation of the case. Adejimi OA. Pyle-type metaphyseal dysplasia. 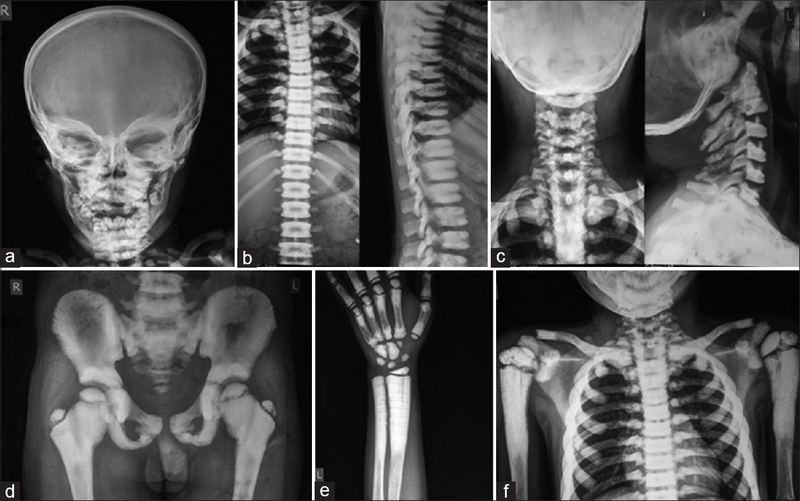 Appl Radiol 2009;38:40A-C.
Wonkam A, Makubalo N, Roberts T, Chetty M. Pyle metaphyseal dysplasia in an African child: Case report and review of the literature. S Afr Med J 2016;106:S110-3. Soares DI, Almeida AM, Barreto AR, Alencar E Silva IJ, de Castro JD, Magalhães Pinto FJ, et al. Pyle disease (metaphyseal dysplasia) presenting in two adult sisters. Radiol Case Rep 2016;11:405-10. Beighton P. Pyle disease (metaphyseal dysplasia). J Med Genet 1987;24:321-4. Oppenheimer C, Oliveira BCG, Sogabe M, Sanvito WL. Pyle's syndrome: Case report. Archives of Neuro-Psychiatry 1996; 54: 120-3. Pyle E, Conn W. A case of unusual bone development. J Bone Joint Surg Am 1931;13:874-6. Gupta N, Kabra M, Das CJ, Gupta AK. Pyle metaphyseal dysplasia. Indian Pediatr 2008;45:323-5. Khanal D. Metaphyseal dysplasia: A rare case report. J Clin Case Rep 2016;6:726. Narayananan VS, Ashok L, Mamatha GP, Rajeshwari A, Prasad SS. Pyle's disease: An incidental finding in a routine dental patient. Dentomaxillofac Radiol 2006;35:50-4. Gorlin RJ, Koszalka MF, Spranger J. Pyle's disease (familial metaphyseal dysplasia). A presentation of two cases and argument for its separation from craniometaphyseal dysplasia. J Bone Joint Surg Am 1970;52:347-54. Lindberg EJ, Watts HG. Postosteotomy healing in Pyle's disease (familial metaphyseal dysplasia). A case report. Clin Orthop Relat Res 1997;341:215-7.